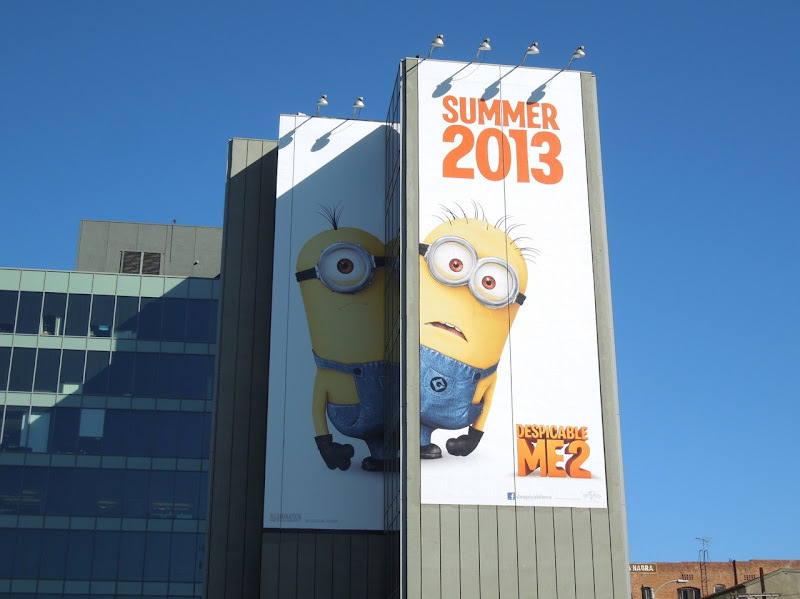 Former criminal mastermind 'Gru' is back with his mischievous Minions for another big screen outing in Despicable Me 2. 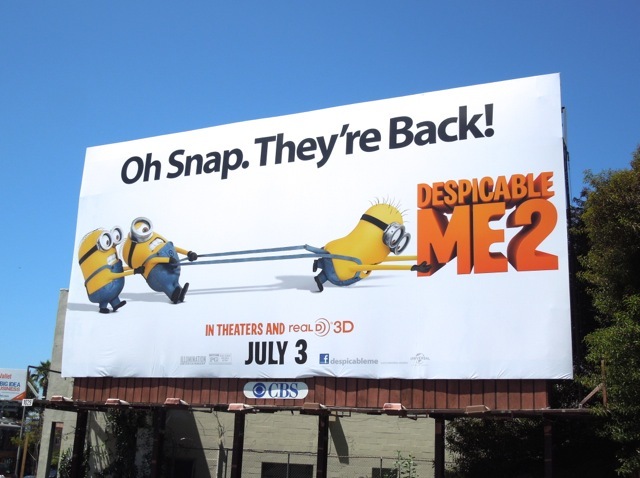 Once again the yellow pill-shaped creatures take center stage in the advertising for the sequel, because let's face it, they are the stars of the show (sorry Steve Carrell, but it's true). 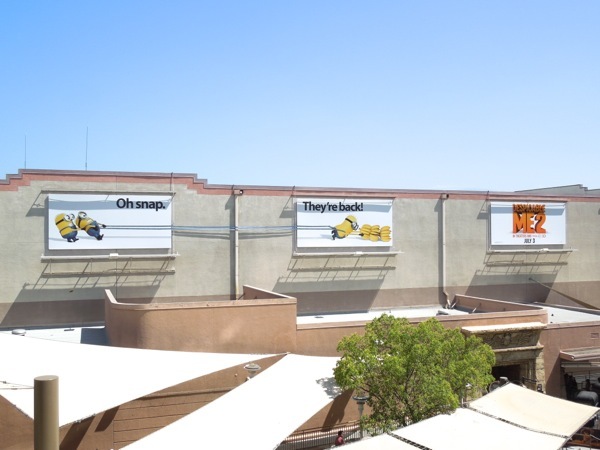 These two super-sized billboards for the computer-animated comedy were spied at Highland and Fairfax Avenues on June 4, whilst another 'Oh Snap. 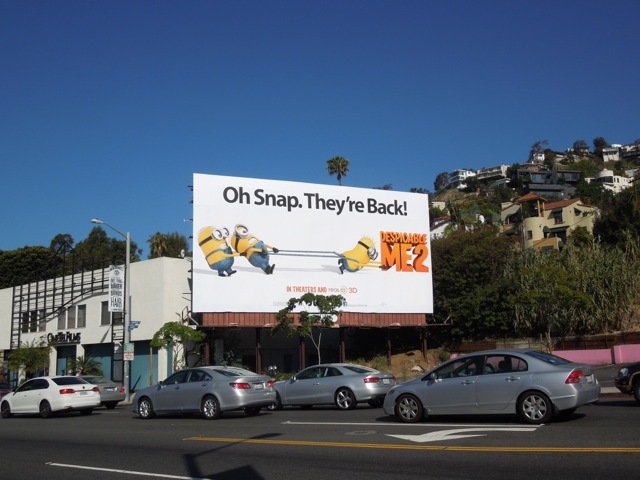 They're Back' billboard was spotted along busy Sunset Boulevard on May 29, 2013. 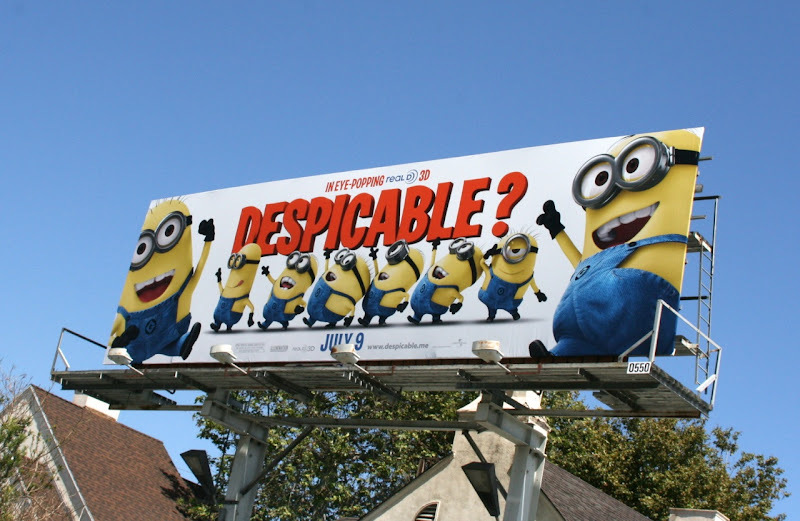 In this movie reformed bad guy Gru, his three adopted daughters and his Minions are recruited by the Anti-Villain League to help save the world once more, because sometimes it takes one evil genius to catch another evil genius. 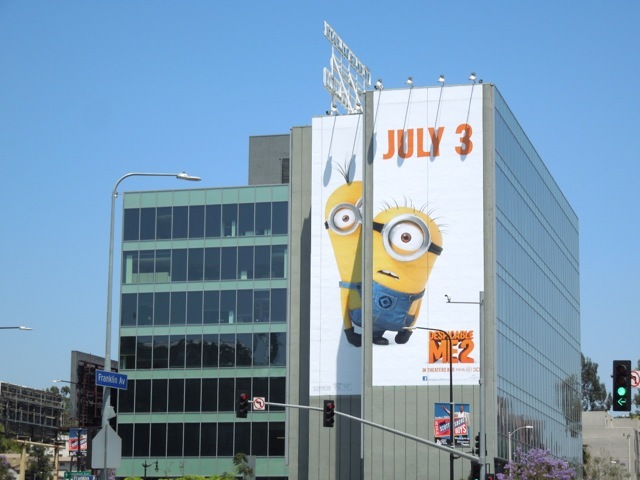 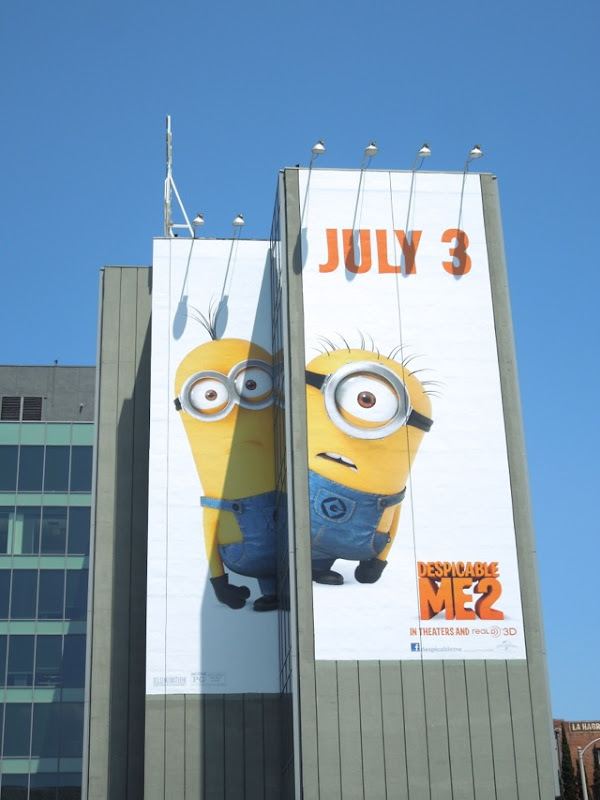 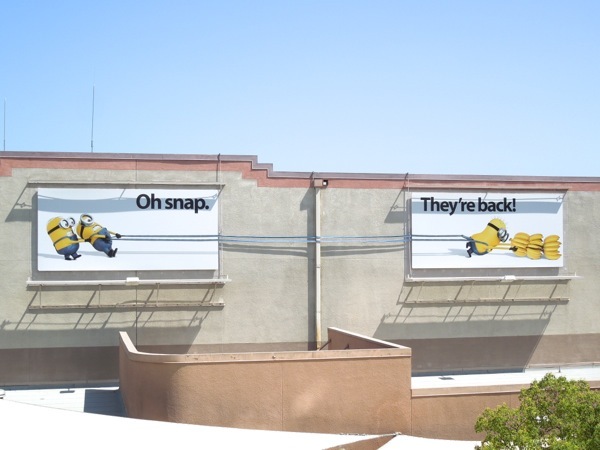 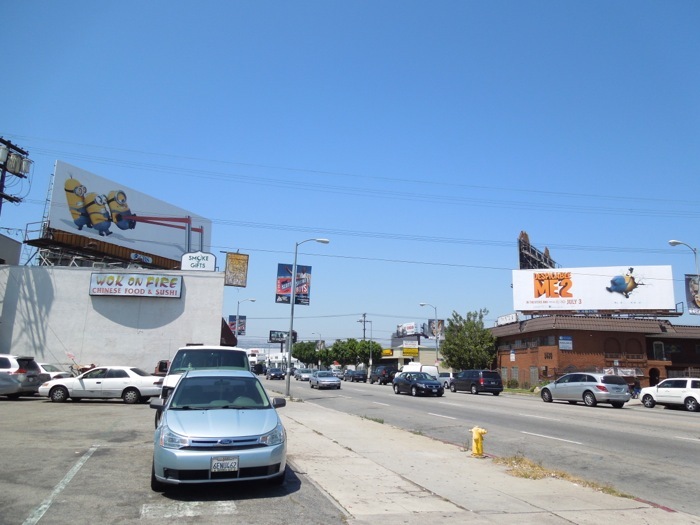 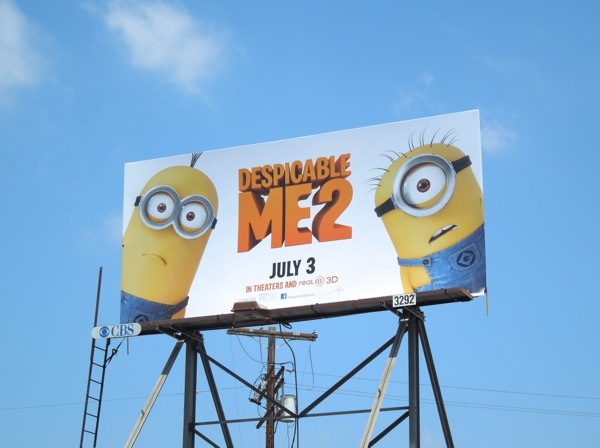 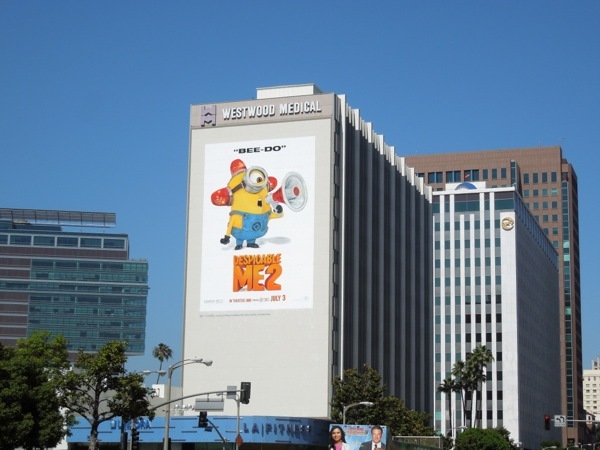 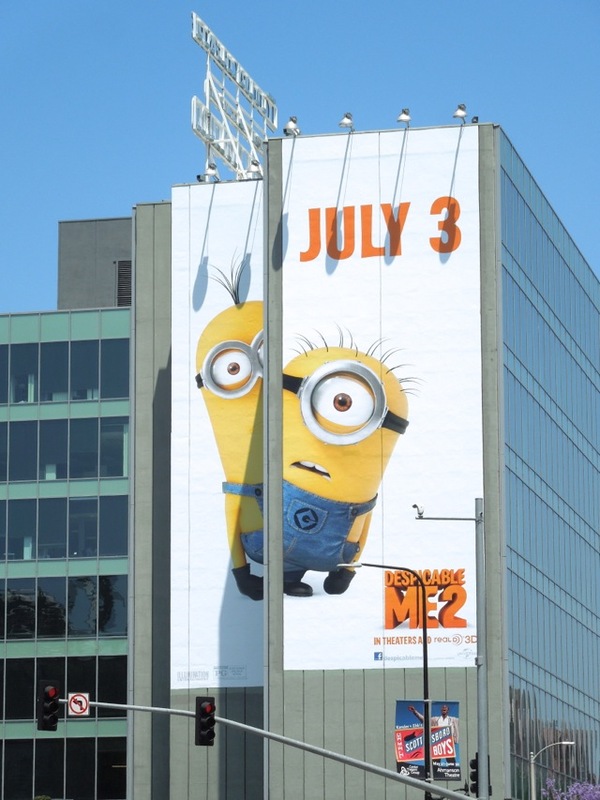 To help get audiences excited and build awareness for the sequel, Despicable Me 2 also had these teaser billboards (with different Minions) in the same Hollywood location on October 26, 2012. 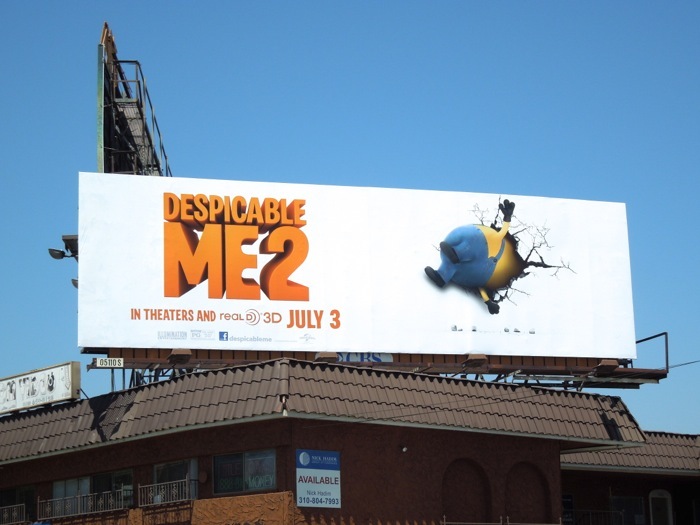 And for completions sake, here's a glimpse at a billboard for the first movie snapped along Westwood Boulevard three years ago on June 19, 2010. 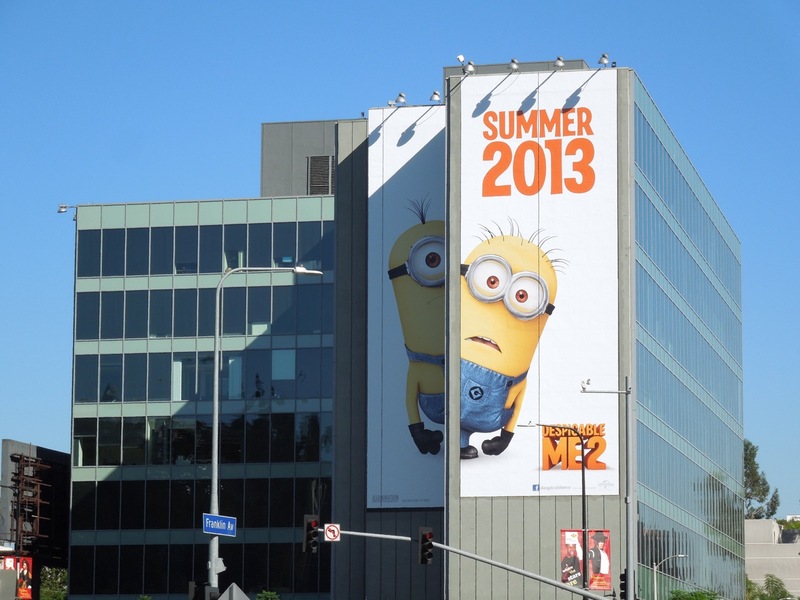 UPDATED: Here's another mini creative with those cute yellow imps spied along Melrose Avenue on June 5, 2013. 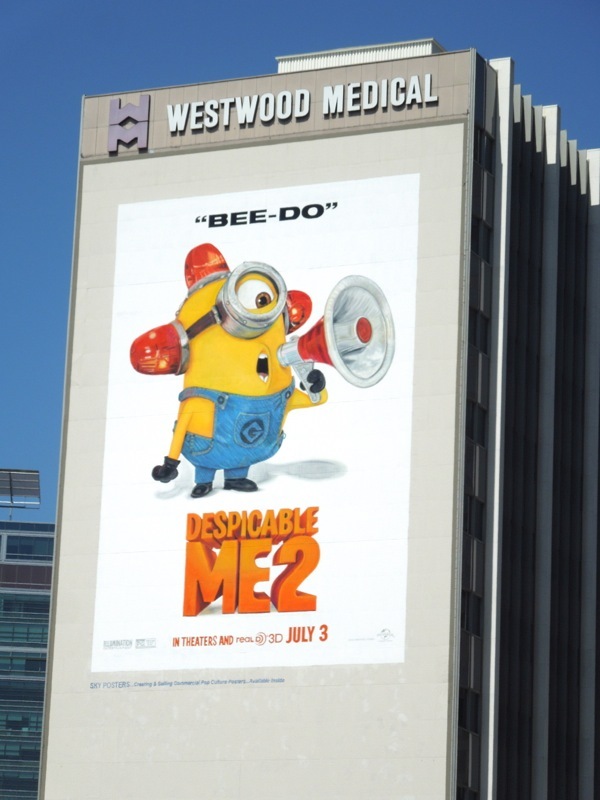 Plus this super-sized 'Bee-do' creative was spotted along Wilshire Boulevard in Westwood on June 15, 2013. 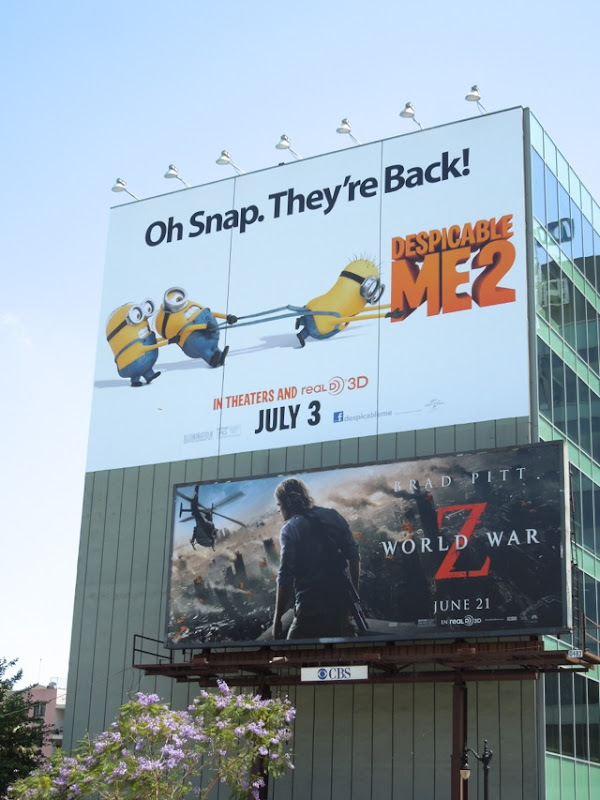 Universal Studios certainly are having lots of fun with their Minions for this sequel. 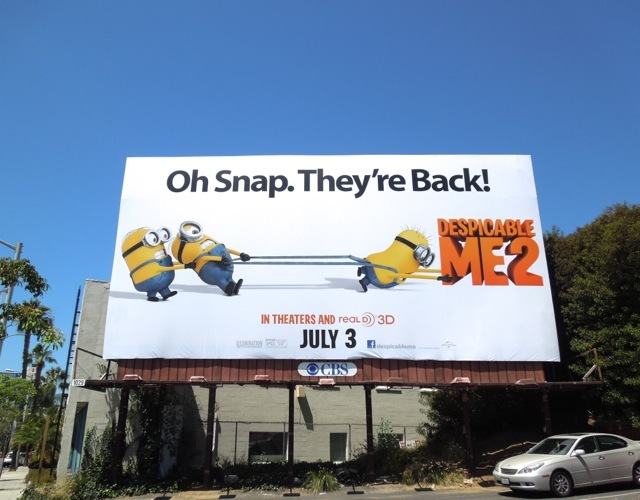 UPDATED: In addition, driving north along La Cienega Boulevard Daily Billboard spied this clever comedy catapult creative for the movie. 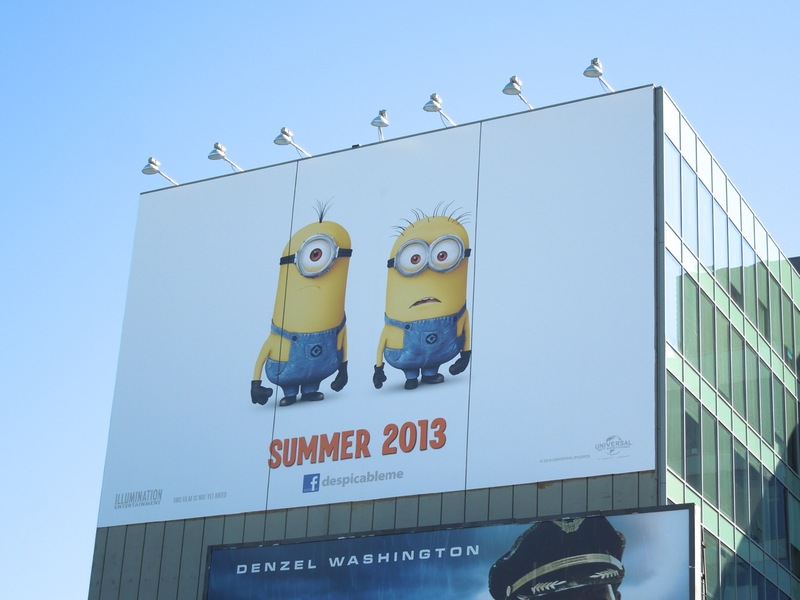 This fun billboard duo on opposites sides of the street was snapped on June 17, 2013. 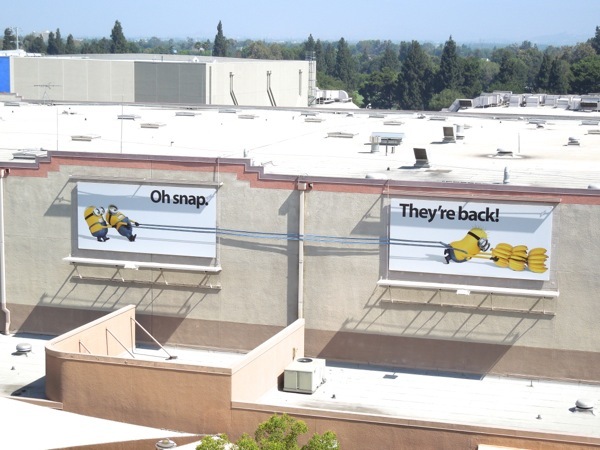 UPDATED: Daily Billboard recently ventured to Universal Studios Hollywood on July 30, 2013, to get more material for our sister Costumes and Props blog, and at the same time spied this inventive special ad installation in the Lower Lot of the amusement park. 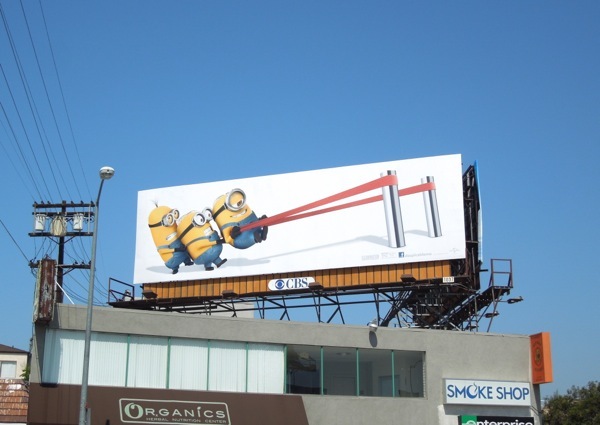 Can you imagine the opportunities for thousands of visitors to see this fun billboard installation, featuring those troublesome Minions, when they are riding the stairway up and down.